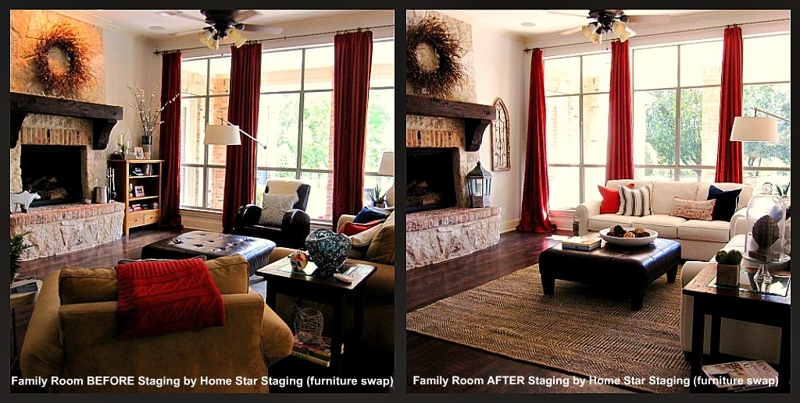 For SAR’s stager trainer, Karen Otto, consultations amount to 70% of her staging income in today’s real estate market. Sometimes the service is paid for by the realtor, as a value-added benefit to secure the listing. Karen says that a solid 30% of those consultations turn into a full-fledged staging, and some home sellers just need one follow-up appointment for tweaking. And so it was in the home below; and notice how dramatic the change is when an experienced, talented stager gets in the mix! Step 1 was a two hour consultation. The home owner took notes and felt he had a good idea of what needed to be done. He depersonalized each space, put a lot of things away and did his best to add a few accents here and there. Proudly, he stood back and waited for Karen’s team to return with a stamp of approval. Step 2 was Karen’s Staging Redesign. used glass to add light to an otherwise matte surface like the brick fireplace. It’s a masterful presentation of what looks like a very livable yet impressive home. Professional Photographs! It’s the color, the contrast, the clarity, the composition… so many aspects of great photos that take a stager’s excellent work over the top into magazine and professional design quality. A poor photo can obscure even the finest work. This is one little extra that is vital in today’s marketplace, especially if you’re in an area where you’re competing against New Construction. 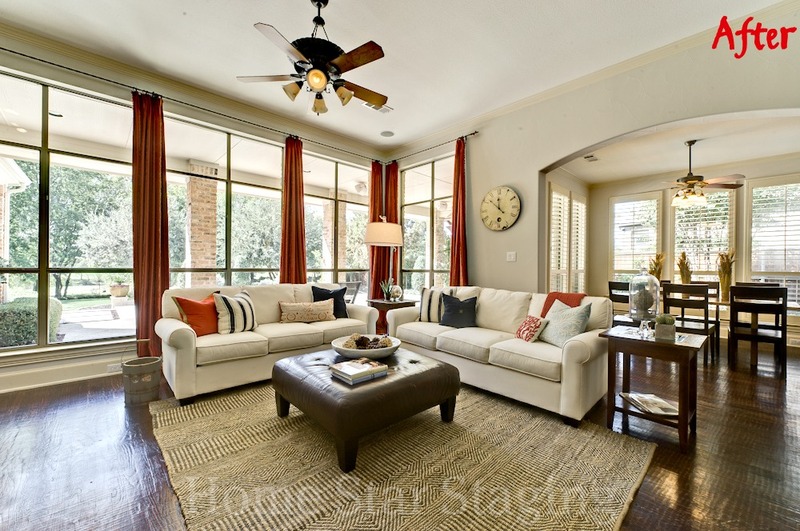 Priced around $125 – 150 for 25 shots, most photographers will make a staged-home spectacular. The fee is most often paid by the realtor. If you, the stager, have to pay it, then try to find a new photographer or photography student looking to build their portfolio. It’s worth the effort. As to this home, everyone’s really excited for it to come to the marketplace. It sure looks like a winner, doesn’t it? The Texas Two-Step: a consultation followed by a return tweak. 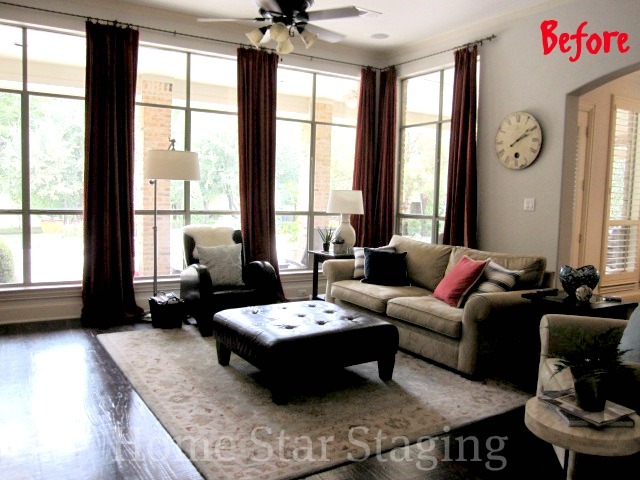 Do you offer this service in your staging business? What’s been your experience? « You’re a home stager? That must be so glamorous! 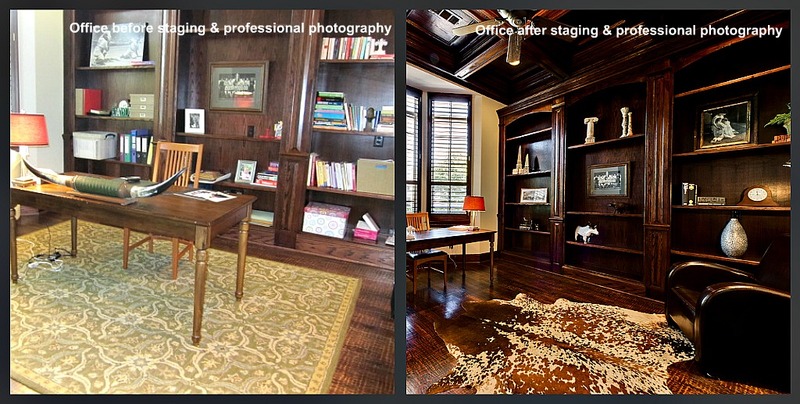 It is always amazing to me how minor changes can make such a huge difference in the feel of a room. Based on the pictures I’ve seen on the MLS, more agents should work with a professional photographer. thank you Kathy! Home sold in 27 days!